Those are some very warm ears. It's not exactly Oscar Gamble circa 1974, but Toby Bianco owns admirable 1970s head insulation. This card's a microcosm of most minor leaguers who taste the big leagues. Bianco showed power with AAA Sacramento (44 HR in 1974-75), earning a couple of 1975 call-ups, but collected just 5 singles and a double over 18 games with the Brewers, an extended cup of coffee that proved to be his whole MLB career. 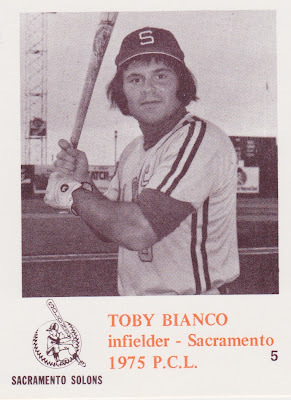 Toby followed Milwaukee's AAA shuffle to Spokane in 1976, becoming their "most popular player" with fans, but the crowded MLB infield of Sal Bando, Robin Yount, Don Money, and Cecil Cooper (with Jim Gantner waiting in the wings), pushed Bianco to the streets in 1977. Toby ultimately did catch on elsewhere, spending three more seasons in the Tiger, Expo, and Oriole systems before retiring in 1979 (career stats). Caruso printed 22 blank-backed cards for this set and those in bold went on to MLB careers, if not stardom. 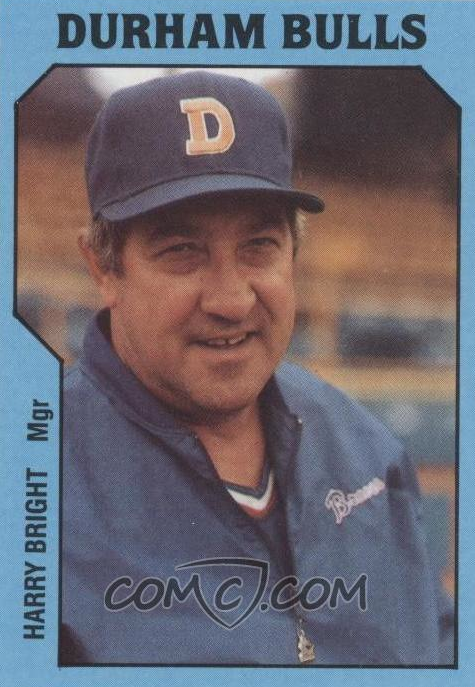 They didn't include any for the coaches, so I added this card of Solons manager Harry Bright, a baseball lifer whose playing, coaching, and scouting career stretched from age 16 to 70. Value: This #5 cost $3 at MinorLeagueSingles.com. The annual SCD priced a full set at $15-20 and I haven't seen any in the marketplace to say otherwise. Fakes / reprints: It'd be easy to reprint with modern equipment, but hard to find a market for them.